“There are no fish in Estero Bay”. That was always the tongue in cheek answer given by the locals when asked, “Where was a good place to fish in the bay”. I have been fishing Estero Bay for around 20 years with varying results, but I can tell you now, the fish are back! Estero Bay is a small inlet covering only about 15 square miles in Southwest Florida, protected by a chain of barrier islands Hickory Island, Lover’s Key and Estero Island. Estero has 2 rivers empting into it, the Imperial and Estero Rivers empty and boasts 4 passes Matanzas, Big Carlos, Big Hickory, and New Pass. There was always the opportunity to catch a few fish here, there just never were a lot. This year Estero Bay has been extremely productive, with the most prevalent species being Redfish. Years past with a ton of boat traffic and kayakers would have to search the backwaters for reds, not this year they are catching them everywhere. The size and number of fish being caught rival that of Estero Bay’s cousin, Pine Island sound. These fish behave pretty typically, hanging out under the mangroves during high tide, and cruising the flats as the tide falls. They will eat anything, cut bait, live shrimp, pinfish, Berkley Gulp on a jighead, or my personal favorite, DOA Glowshrimp. The reds are also a lot bigger this year, easily reaching over 40 inches. Estero Bay is easy to get to and very kayak friendly. From Hickory Pass northward, there are many launch areas for both the Gulf and the Bay. The Great Calusa Blueway Paddling Trail is a 190-mile marked canoe and kayak trail that takes kayakers through the backwaters of Lee County, including Estero Bay. All along Hickory Blvd there are access points to the Bay and the paddle trail. Lover’s Key State Park offers a kayak launch as well. All of these launches offer great fishing for snook, redfish, trout, jacks, and even sharks. Bonita Springs, at the south end, and Ft Myers Beach to the north have accommodations and many bait and tackle shops who will fill you in on the latest fishing reports. Online sources such as the Southwest Florida Kayak Angler Association have forums where you can get current fishing information specific to the area you want to fish. Finally, there are restaurants in the area that will be glad to cook your redfish to order. So, next time someone tells you there are no fish in Estero Bay, tell them about the fish you caught while visiting! About the Author: Bob Bramblet is an avid kayak tournament angler. 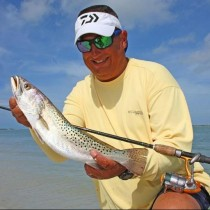 He is the President of the Southwest Florida Angler's Association and the Captain of the Blue Line Fishing Team. Bob writes article for several online sources. So, what you are saying, the fishing in Estero Bay had been bad for many years. It is now back, what happened to change things? Currently, I still do not see many people catch fish. This was written back in October. Yes, I am saying that there were more fish this year that I have ever noticed. I do not know why, and I can't even guess why. Check out the forums at swfkaa.com for local fishing reports and you will see that there are many people catching fish.